At the end of May, I am returning to Ontario with the intention of burying the first Earth Treasure Vase of our lineage in Canadian soil – at the same time as the vase at Gabarnmung will also be buried. Upon receiving this vase, I sensed it singing a song of Peace. I was drawn to the story of the Peace Maker, who unified the Iroquois Nations prior to colonial contact. In November I traveled with the ETV to Ontario, visiting the land and waters of the Peace Maker’s life, the vase guiding me to deep roots of peace beneath militaristic societies and to my own indigenous roots beneath colonizer consciousness. In Ottawa, I was taken to sacred ground near the Chaudiere Falls in the Ottawa River. Indigenous ancestors from across the Americas once made pilgrimage to these falls and prayed into a magnificent swirling vortex at their base, much as we pray into the consecrated vases for the magnification of our prayers. 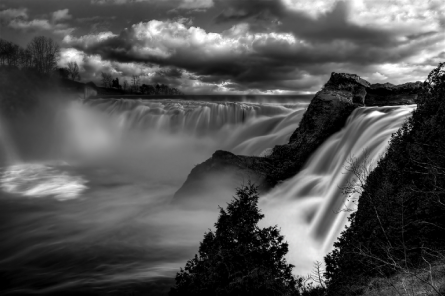 For the First Nations, these falls and the land around them were the heart of our Earth. It was their Mecca. 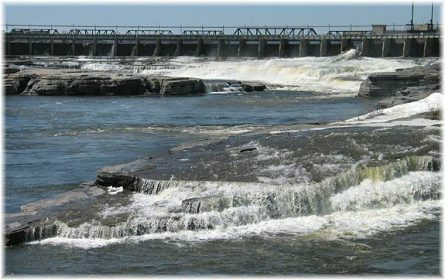 Chaudiere Falls, the majesty before the dam. Today’s Indigenous people from this region have been given a vision of a Peace Center for all Nations to be built on Victoria Island at the base of the now damned Chaudiere Falls. The bowl of swirling waters no longer exists and the sacred meeting grounds are covered with abandoned factories, but the vision is strong for a center where Indigenous Peoples may take their place on sacred ground in care of our Earth once again. Roger Fleury, an Algonquin teacher, led us past factory ruins, which have been incorporated into the design of the Peace Center, to a patch of Earth on the corner of Victoria Island. Before us, he lit a sacred fire containing ashes from a lineage of sacred fires. Through the fire, we connected to the Song of the Earth and to the vortex of Indigenous prayers; calling forth the Culture of Peace, the Circle of All Nations with such strength we were inside its reality. On the opposite bank within view, stood the Canadian War Museum, built with money the government had originally designated for the Peace Center; embodying the human commitment to war and barriers not yet let down. Though the way may be challenging, this sacred heart of the world calls me to make the journey and pilgrimage once again from New Mexico to Chaudiere Falls. It invites this Earth Treasure Vase and all our prayers for a Vision of Peace to be planted in that soil. I pray that right relationship may be found on this Island of Peace and for the rivers to carry our prayers to the world. The 31st Earth Treasure Vase, the 2nd of the next generation of holy vessels, was buried on the new moon of June in the un-ceded, un-surrendered territory of the Algonquin Nation. We give deep gratitude for this land, known today as Ottawa/Gatineau, Canada, for receiving, activating and sustaining the healing emanations of this Earth Treasure Vase. The vase was present in Ottawa for the historic Truth and Reconciliation Report, culminating a six-year documentation of the stories of the Indigenous population who survived forced attendance in Canadian Residential Schools. The healing of the Indigenous people and our (the colonizer’s) relationship with them was a dominant theme working through this vase. The Canadian ETV seemed destined for the islands in the Ottawa River at the base of Chaudiere Falls – this region being one of the most sacred sites of the Indigenous People. But because of political strife over whether this site will ever be returned for their use and current Indigenous sensitivity brought forward during the Truth and Reconciliation proceedings, the vase was guided by Grandmother Annie St Georges to be buried in the Mackenzie King Estate, a beloved public park on the bluff overlooking the Ottawa River Valley. The way opened, as the park director and staff unanimously agreed to receive the vase and offered a location where the vase would rest undisturbed for all time. The group in front of l’Arc De Triomphe. Image courtesy of Peter Stockdale. 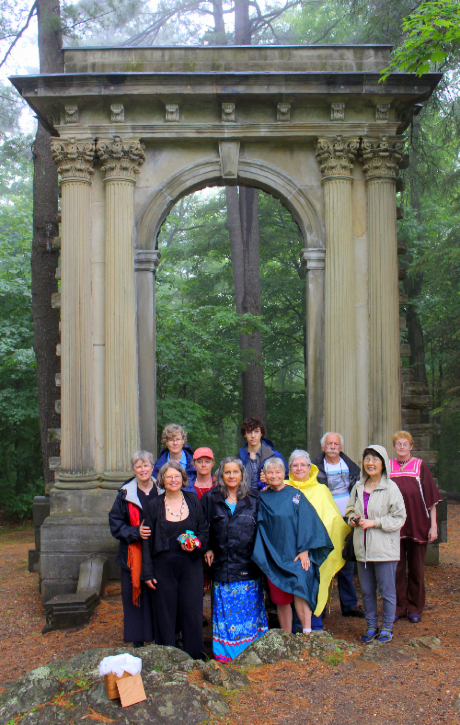 On the way to burying the vase, our group of 12 passed through the formal gardens of the estate and through l’Arc De Triomphe into the woods. For me, as custodian of the vase, this passage was a powerful symbol for stepping out of the colonizer mentality into a unified consciousness with Mother Earth and humanity’s indigenous wisdom. Once through l’Arc De Triomphe, we passed under another natural arch on our way to ceremony and were blessed by a driving rain that turned gentle as we made our way towards the fulfillment of our prayers. Just as the vase took her place in the mandala, the sun broke through, giving herself fully to the work of turning the social tide toward Indigenous and environmental justice. 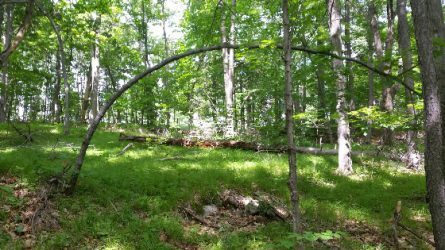 Nature’s living tree arch welcoming us into the woods. Image courtesy of Rhonda Derue. This entry was posted on Friday, June 19th, 2015 at 5:04 pm	and is filed under Burials. You can follow any responses to this entry through the RSS 2.0 feed.